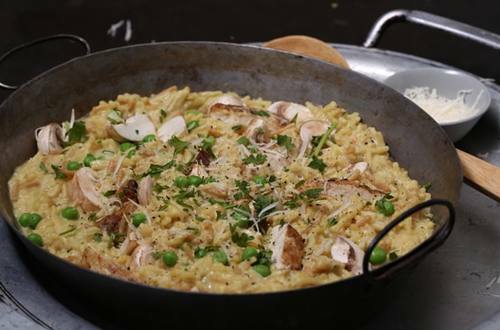 Whip up an Italian classic in just 30 minutes with our Quick Risotto Style Rice Chicken recipe. Dig into a creamy mix of chicken, peas and mushrooms topped off with grated parmesan cheese. 1 MELT 1 tablespoon Spread in large nonstick skillet over medium-high heat and cook chicken, stirring occasionally, until chicken is thoroughly cooked, about 5 minutes. Remove chicken and set aside. 2 MELT remaining 1 tablespoon Spread in same skillet and cook mushrooms, stirring occasionally, until golden, about 5 minutes. Add milk, Knorr® Rice Sides™ - Chicken flavor and peas and prepare according to package directions. 3 STIR in chicken, sour cream and 2 tablespoons Parmesan cheese; heat through. Serve sprinkled with remaining Parmesan cheese. Garnish, if desired, with chopped parsley and cracked black pepper.